Through my connections to Trinamic I have learned that they are a very small company. They probably can't afford a dedicated tech representative. But there is no cost penalty that I am aware of why they couldn't have gone 24 volts. It appears to have just been a carry-over from earlier products. As for the brackets, I saw a while back that they carried them, but they appeared to be perpetually out of stock. For this reason I ordered a full set from RobotDigg recently (I could quite easily have fabricated them myself but I don't have the spare time to do so). I too went into this knowing up front the concerns I would face. And I do not regret my purchase. John is not a member of the forum. I do however link him to threads that I feel he should see, such as this one. I have no official connection with FolgerTech. I do side jobs for them (like the manual updates as of recently) and have a direct way of contacting John. He is a VERY busy man with not enough hours in the day. He does have a lot more going on then just FolgerTech. I know he is having issues keeping staffed as he is located in a pretty small town. He is always hiring and looking for help. They are always having issues just keeping up with orders as the FT-5 took off like wildfire. I do agree there are some changes they should make but it's very hard to do when all they have time for is trying to catch up. Dustin is tech support. He can be located anywhere in the world to answer emails. FT may monitor the forum, I don't know. They do not have an account here that I know of but that does not mean they are not reading posts as a guest. I am in the same situation with the z binding. It's to the point that the motors try for literally a second and the stop trying to move the bed. I did notice that one side on the top of the vertical screw the top mount hole is a bit odd set with reference to the lower mount. I am leaving the top mounts off this far. I did also find out that there were a few beds that were laserd at a slightly different dimention. I think I was unlucky enough to get this said alternate bed. The ones that were cut wrong were pretty far off. It's very obvious when laying the bed support on top of the bottom plate. @Bukow1cm Check the bearings holding the Z Lead Screw at the base of the machine for off-axis seating of the bearing into the housing. This was my problem with Z-binding. The Lead Screw was fine at the bottom, but wanted to be about an 2-3cm out of place at the top. Use the two least poorly seated. Don't connect the top of the lead screw. This is not a poorly seated bearing. The center part is meant to swivel. Some of them have issues moving. Most of the time they can be lubricated and worked free. Some of them need to be taken apart and reworked. At least if you are removing the top ones, you only need 2 of them to function correctly. If you have lead screw or way off axis it will tend to bind at the extreme. He stated he noticed his were off axis, but did not know why. You are a really weird person for trying to correct something that you didn't read correctly. Take a chill pill, you act like FT pays you your only form of income. No hate here, but it feels like you're trying to cut me down for trying to be a nice person. I never tried to get the bearings to do anything but be perpendicular to the base. That is, I don't know about freely swiveling, but as I have stated in my build log, I am not sure if the KFL08 (on the base plate of the FT5) are being properly used. 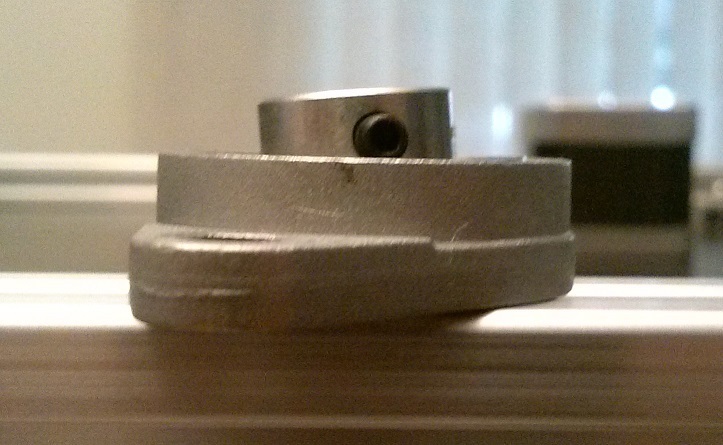 The bearing is only supported on the bottom of the housing. Note that in the current FT5 design, the KFL08 are mounted on the underside of the base plate, or should I say upside down, so the only thing holding the bearding in the housing is friction. I am not sure that is good design. I mounted the KFL08 on top of the base plate in my design. I can't say I have ever heard anyone reporting their bearing has slipped free of the casing (why does that sound like a euphemism? ), but it just does not look like the part is being used correctly in this application. Your statement was not correct. I gave supporting info as to not lead others in the wrong direction. I don't see how explaining what the part actually does is supporting FT. It sounded like Bukow1cm had the same problem I did. I had a z-binding issue myself until I found that having two off-axis bearings at each end of the lead screw wants to bend the screw significantly. This bending force was binding the z-axis by putting serious pressure on the brass lead screw nut on the hot bed base. If the bearing was sufficiently off-axis this would still occur even in there were no top mounts and the bearing moved freely. Please, don't dictate to me I'm incorrect when you think you have the world understood. Yes, some bearings are fully seized. No, not all z-binding happens from seized bearings. Oh, and thank you for this forum. I wouldn't have know these things are unnecessarily fire hazards due to poor hardware selection without it. Originally, I bought this product for the joy of building something. The joy of building something is the only real reason people buy kits. LEGO wouldn't not exist if building stuff wasn't fun. This thing is a nightmare I cannot recommend to anybody. @csorrows I don't want to start beef with you, dude. You seem pretty cool. I have serious personal psychological issues because of my childhood with people telling me I'm incorrect when they are clearly missing something. I apologize if we started out poorly. I apologize if I made you feel your intelligence was violated. No, not all z-binding happens from seized bearings.My statement is correct. I agree with you 100%. This was not the statement I was attempting to correct. What I was trying to correct was the fact that it is not a seating issue but a frozen issue from poor manufacturing. Quite a few of the parts in the kit suffer from this downfall. I am well aware of the quality, or lack of, on some of the parts included. It's pretty much a lottery. Most of the issues however can be solved with a little know-how and work. I'm sorry we had a misunderstanding. Do not mistake that this in no means felt like an attack on my intelligence. I'm quite confident in that. Probably a bit too much sometimes. Take care man and thanks for your contributions. For those of you who experienced badly cut parts, that flaw seems to continue unabated with the ACM components. I had problems with both the base plate and some of the bolt holes being drilled either too deeply and bottoming out (for example, on the linear bearing slide, requiring me to buy washers) or not deeply enough, requiring new screws. I have not checked the Z axis rod and screw alignment, but it's astonishing to me that this issue hasn't been fixed in all this time, nor time take to QC parts. There's an old saying: "It takes less time to do a thing right once, than to explain why it wasn't done right in the first place." I don't accept the excuses and insulting suggestion that because it's a kit we should content ourselves with substandard parts. Nor do I find "busy" to be an adequate or professional reason. If it happens to be that John has so much to take care of that he doesn't have time to tend to his FT customers, chances are he won't have any left because we'll be too busy giving our money to other suppliers until he figures it out. Anyway, my kit was ordered right after Thanksgiving, so this issue should have been resolved long ago. The product has great potential, but suffers from a shameless and inexcusable lack of QC, and I've already discussed my experience with two friends who are likely shopping for other products right now. Prior post was 4 months ago. Please start a new thread.